Special versions of many kits were made for the mail order firm Quelle. Apart from a few details, they are indentical to contemporary Philips (and later Schuco) kits. The Philips/Quelle 24739 basic kit and its expansion 24700 are actually more common than their very rare normal counterparts EE 1010 and EE 1011. 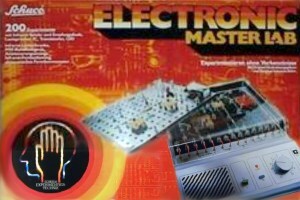 Like EE 1010 kits, 24739 at first included the EE 1003/04/05 manual from 1970; later the EE 1010/11 one – also from 1970 –, and finally (and most commonly) its own manual dated 1971. The diagram shows the kits in the series; basic kits on grey background, expansions on white. The combination of both kits is eqivalent to EE 1003, and can accordingly be further expanded with EE 1004, EE 1005, EE 1007, or EE 9050. I do not know of any difference between these Quelle kits and their normal counterparts. Philips/Quelle 11142 / Labor 1 correspond to EE 2040, 11233 / Labor 2 to EE 2041, 11253 / Labor 3 to EE 2050 with a few components such as the loudspeaker and the transistor from EE 2051, and 11262 / Labor 4 to EE 2052 and the rest of EE 2051. The diagram shows the kits in the series; basic kits on grey background, expansions on white. The combination of Labor 4 and either Labor 3 or Labor 1 and Labor 2 is eqivalent to EE 2003, and can accordingly be further expanded with EE 2004, EE 2007, EE 2010 or EE 3020. In later versions of the kits, two further digits were appended to the identifying numbers, expanding them from five to seven digits, and new kits added later were also given seven digit codes. There is considerable variation in how the digits of these longish codes are grouped for legibility – 6+1 and 3+4 separated with spaces and 3+3+1 separated with periods all occur. For consistency I will apply the latter method even where not originally used. Labor 1 became 111.420.6, Labor 2 became 112.330.6, Labor 3 became 112.530.1 and Labor 4 became 112.620.0. 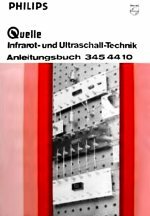 Philips/Quelle 345.421.2 / IC-Technik aka Labor 10, and 345.441.0 / Infrarot- und Ultraschall-Technik from 1977 correspond to EE 2013 and the combination of EE 2016 and EE 2017 respectively. 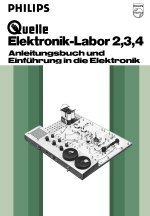 The later Labor 0 from 1980 is similar to EE 2002, but while that kit combines EE 2013 and EE 2003, this kit combines Labor 10 (equivalent to EE 2013) and Labor 3 (a subset of EE 2003, lacking mainly the radio-specific components). I don't know of any other difference between the Philips/Quelle kits and the normal ones. I have never come across any Quelle versions of EE 2010, EE 2014, EE 2015 or EE 2001. 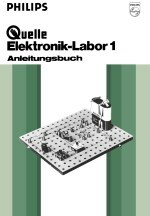 There are both Philips/Quelle and Schuco/Quelle versions of the four basic kits A–D. Both were originally just marked by stickers on the box lid, but the latter eventually got different numbers and titles: 6121 A · Start Lab, 6122 B · Studio Lab, 6123 C · Master Lab and 6124 D · Super Lab. The two smaller kits have minor additions (an LDR in the A kit), with a few new constructions described in a leaflet. 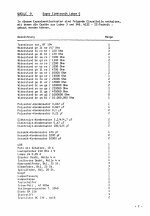 The Quelle chemistry kit 26280, later 262800 6 probably corresponds closely to CE 1402. 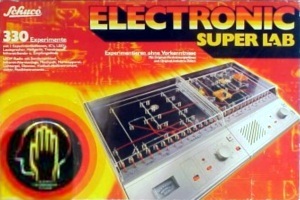 The main picture on the box is a mirror image of the one on CE 1402, while the picture on the manual is surprisingly taken from the CE 1401 manual instead. Perhaps the contents cover parts of both kits, just as the Quelle physics kit 26279 cover both PE 1501 and parts of PE 1502? In any case, that these two Quelle kits were given consecutive numbers indicate that they were contemporary, giving 1971 as the probable year of introduction for 26280. 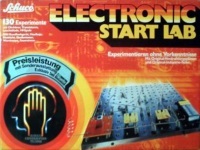 There was made a Quelle variant of the 6601 A · Basis Lab kit from the ABC or 6600 series. Initially it used the same name, number, box and manual as the normal kit, only distinguished by a sticker on the box cover with a larger number of experiments (300 instead of 275) and a four-page leaflet included in addition to the manual. 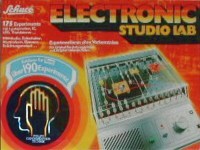 Later the kit was renamed to 6631 A · Studio Lab, but although this meant changing the box cover, both the text mentioning 275 experiments and the sticker with the number 300 were kept. The leaflet accompanying the manual was even later updated to no longer refer to the name Basis Lab . 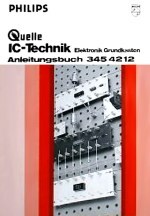 The Quelle physics kit 23171 is a subset of PE 1550. The box has the same main picture (only in black and white) though not all depicted parts are included. I have never seen the manual to 23171. 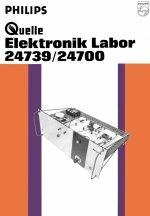 The Quelle kit 26279 from 1971 contains all the material from PE 1501 and some from PE 1502. All box and manual cover pictures are taken from PE 1501. The Quelle kit 593743-8 seems to contain parts from both PE 1500 and 1540, without covering all of either kit. The manual and main box cover picture is taken from the PE 1540 manual; the smaller ones on the box are both from PE 1501 though one of them is also reused on PE 1500.